I've been hearing some chatter about secret "Hero Units" in XCOM - soldiers with pre-defined names, attributes, and abilities. Hero units are created by specifying their first and last name in the barracks "Customize" screen. Once you do this, your soldier will be replaced by the hero unit. These units are considered to be cheats, though, as they are super-powered. They have high stats and start with advanced gear. You will be notified when you specify a hero's name that achievements are disabled as a result. Also note that customization of these heroes is disabled - you can't change their names or any of the other options on that menu (armor color, armor type, gender, etc). You can also take their gear, but your other soldiers can't use it without doing the appropriate research. You can summon as many clones of each hero as you choose. If you want to field a team of all Sid Meier clones, you are free to do so. 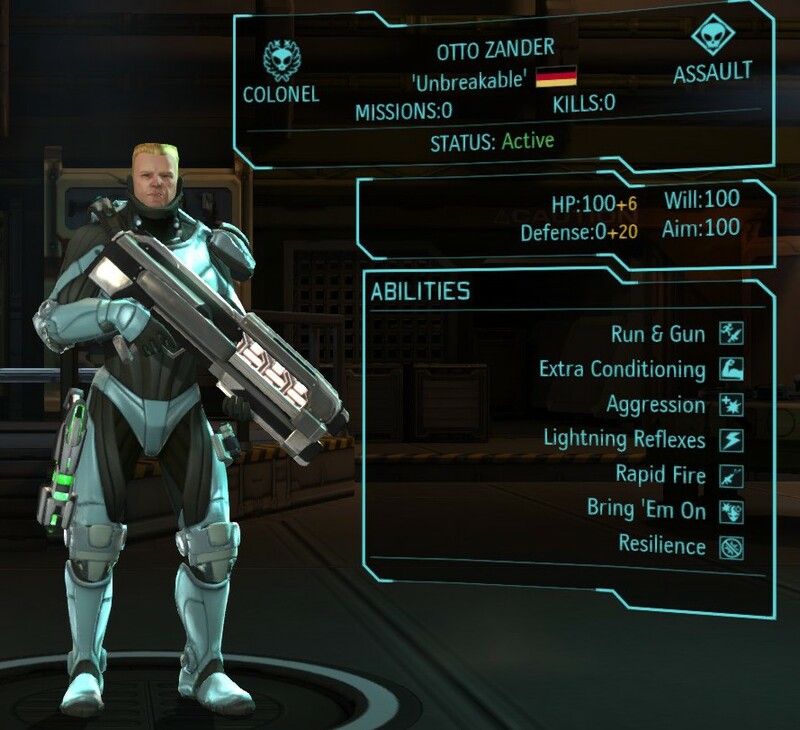 Otto 'Unbreakable' Zander - a reference to a popular XCOM Let's Play series by GuavaMoment. Search this file for "SuperSoldierFirstNames" and you'll come across all four, in addition to the strings that prompt you when you enter their name. Kotaku also has a video guide which shows off summoning Sid himself, as well as Ken Levine. The developers explained how to create the hero unit in the first GiantBomb's quicklook. Its at the end of the video. To create the hero, just enter the name Sid for first name and Meier for last, on any soldier and it creates the hero. Beware, I believe having this hero disables achievements for the current playthrough. The dev's also mention that there are other heroes in the game, but they didn't reveal them. What actions gain experience for units? What do distance units mean? XCOM sniper cover bonus damage to aim? What is a units sight range in tiles?